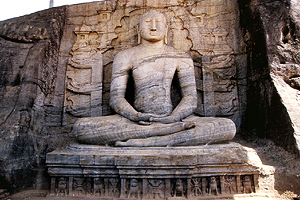 There are three different kinds of rock-cut sculptures in Sri Lanka as wel as in other parts of Asia, viz standing statues and sitting and reclining sculptures. Each of the postures can be seen side by side at on place in Polonnaruwa, which is called Gal Vihara. Actually, this Gal Vihara goup of rock-cut statues of Polonnaruwa are the greatest achievement of monumental art on the island and maybe the most excellent works of rock-carved Buddhas at all, though surpassed in size by rock statues in China and Central Asia. However, the world-famous Gal Vihara statues of Palonnaruwa are by far not the only rock-cut Buddha sculptures in Sri Lanka. The best example of a standing Buddha is the Aukana statue. It's counterpart is the Sasseruwa statue of almost equal size. 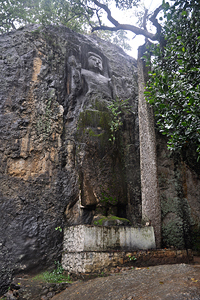 The tallest standing statue carved from rock is however in the south of the island, it's the central statue of a group of seven rock-cut Buddhist sculptures in Buduruwagala. Another giant standing statue of a Buddha is worth mentioning here. 40 km east of Buduruwagala is Maligawila. 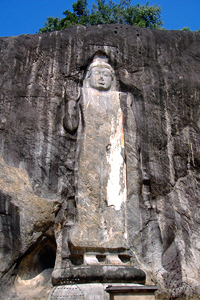 The Maligawila Buddha statue and another colossal statue in the same excavation area, depicting a Bodhisattva, are not standing in front of a rock like all the other statues mentioned above, The huge Buddha statues in Maligawila are nevertheess rock-cut, too. Theay are monotlithic, abd after being carved from the rock they had to be transported miles away to their final location in Maligawila. All those standing Buddhas from the northern Cultural Triangle or the southern Ruhunu area, are presumably from the same period, with the exception of the standing Buddha belonging to the Gal Vihara group in Polonnaruwa. But there is some uncertainty regarding the standing Gal Vihara sculpture concerning its meaning and is dating, too. Most people believe, the standing statue of the Gal Vihara grup is not depicting the Buddha but his disciple Ananda. And it is not quite sure, if the entire Gal Vihara Group in Polonnaruwa is indeed from the Polonnaruwa period or earlier. However. it seems most likely, that the Gal Vihara group is indeed from the reign of Parakramabahu the Great in second half of 12th century, which is the climax of the Polonnaruwa period. Apart from this Ananda statue or Gal vihara standing Buddha, all the other giant rock-cut Buddhas in Sri Lanka seem to be from the earlier Anuradhapura period. You will find several very different datings in different guide books as well as in the scientific debate. The eraliest dating would be that of the Sasseruwa Buddha to the 3rd century C.E., making it even earlier than the Bamiyan Buddhas in Afghanistan, which were destroyed by the Taliban in the beginning of our century. Probably, if from the 3rd century, it would be even earlier than the first giant rock Buddhas in India, in the Himalayan region of Ladakh. Another early dating found in many books is that of the Aukana Buddha to the 5th century. But there is little evidence for this. The most likely dating of the Aukana and Sasseruwa Buddha as well of those in the south, Buduruwagala and Maligawila, is the late Anuradhapura period, somewhat between th 8th and 10th century. ​There is another feature shared by all these standing Buddhas, they could be influence by Mahayana Buddhisms. Maybe this is the reason why remarkably none of them is mentioned in the Mahavamsa chronicle, which otherwise gives detailed account of every Buddha statue donated or restored or embellished by a king. The Mahayana chronicle is written by a monk called Mahanama in the oldest monastery of Anuradhapura, the Mahavihara. The Mahavihara tradition always strictly adhered to the Theravada tradition and rejected Mahayana influences. The Buduruwagala statues and the Dambegoda Bodhisattva statue in Maligawila are obviously Mahayanist. The latter wears a royal garment, which is typical for Bodhisattva statues. The Mahayanist iconology is not as clear in the case of those other standing rock statues depicting Buddhas and not Bodhisattvas. But wait a minute, the central and tallest sculpture in the Mayanist group of Buduruwagala is not a Bodhisattva, but also a Buddha, too. There are indication, that it's not the historical Buddha, Shakyamuni, but his first predecessor, Dipankara, venerated by Theravadins and Mahayanists alike. Similarly, the giant Buddha statues of Aukana, Sasseruwa and Maligawila could depict the Buddhahood more than the Buddha person, Buddhahood being the supreme form of being in some Mahayanist teachings. The sheer size of the Buddha sculptures makes them appearing as supernatural. And indeed, the magnitude itself could be an indication that not the historic person called the Buddha but some much higher form of being is illustrated by those Sri Lankan rock statues. But there are more giant Buddhas in Sri Lanka than those standing statues in Aukana, Sasseruwa, Buduruwagala and Maligawila. The Gal Vihara group, as already mentioned, was most likely constructed some centuries later, viz in the Polonnaruwa period. Besides the Gal Vihara group, there are two more huge rock-cut Buddhas in Sri Lanka which are believed to be from that period, too. 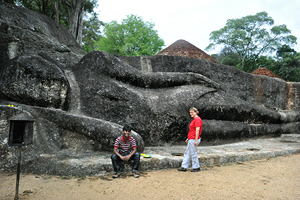 Both of them, the Thanthirimale Buddha and the Attaragollewa Buddha in Bakamuna are reclining Buddhas, though not of the same artistic perfection as the Gal Vihara recling Buddha in Polonnaruwa. These three giant Buddhas share another characteristic feature. Most recling Buddha statues in Sri Lanka are sleeping Buddhas, but those three of huge size and cut from the rock are dying Buddhas. The passing away of the Buddha is his Parinibbana, called Parinirvana in Sanskrit, the reaching of the final or perfect Nibbana (Nirvana in Sanskrit). Parinibbana Buddhas are more intimately connected to the Theravada tradition than to Mahayana, as death is more human than superhuman, his death is one of the four main events in the life of a Buddha in human form, besides birth, enlightenment and first preaching. Passing away is exactly what is avoided or delayed by those Mahayana Buddhist saviours, Bodhisattvas, who renounce death and Parinirvana in order to save others within this world. Furthermore the horizontal representation of a Buddha is less awe-inspiring than that of a vertical statue of the same size. 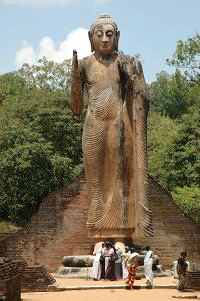 Both the standing Ananda and sitting Buddha in meditation posture from the Gal Viihara are from the same Polonnaruwa period and Theravadic, too. The village of Aukana, situated near the huge ancient tank Kalawewa, is home to Sri Lanka’s largest ancient Buddha statue which is cut from a rock. The standing Buddha statue is 12 metres high. It has become one of the defining symbols of Sri Lankan Buddhism, full-scale modern copies of the Aukana statue can be found in several cities all over the island. The Aukana Buddha statue, though often attributed to King Dhatusena, who was the the builder of the Kalawewa in the 5th century C.E., is more likely a work from the 8th or 9th century. contemporaneous with the giant rock-cut statues of Buduruwagla in the south of the island. But in contrast to those Buduruwagala reliefs, the Aukana Buddha is carved in the round, almost entirely separated from the rock behind it. 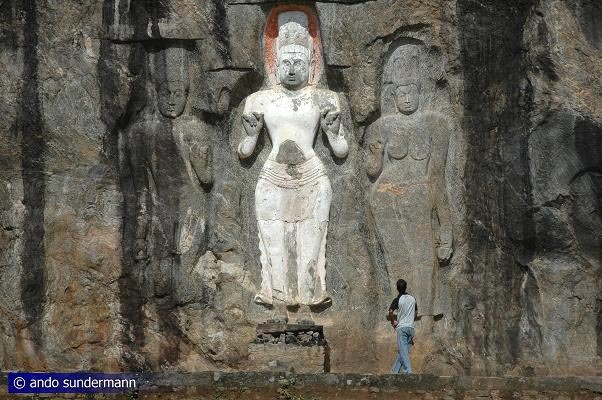 It is also worked out more elaborately than those reliefs of other Sri Lankan rock-cut statues. Regarding the artistic quailty, it is surpassed only by the Gal Vihara statues in Polonnaruwa. Particularly the robe of the Aukana statue is of magnificent beauty. The statue’s posture is the unusual “Asisa Mudra”, a blessing gesture eith the right hand turned sideways to the viewer. Morning hours are definitely the best time to visit the Aukana Buddha, as it is then illuminated by the sunshine perfectly well. “Aukana” is often translated as “sun-eating”. 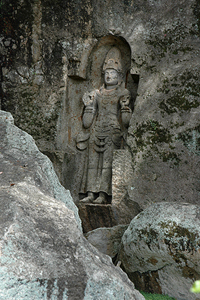 The Sasseruwa Buddha statue is located only 11 km west of Aukana. 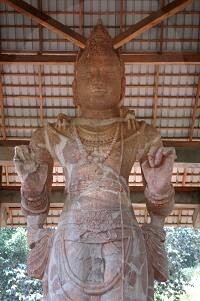 It belongs to a cave temple called Rasvehera, therefore the Sasseruwa statue is also called Rasvehera statue. Many other spellings can be found, for example Sesuruva Buddha or Reswehera Buddha. The Sasseruwa Buddha statue is almost of equal height as the Aukana statue, though it is not entirely completed. There is a famous legend onnecting it to the Aukana Buddha. So the story goes: The two statues were carved at the same time in competition between a master and his pupil. Such competitions are called "Guru-Gola". When the master managed to complete his perfect Buddha statue in Aukana first, he rang a bell to inform his pupil about his success. Hearing the sound of the bell, the frustrated pupil realized his own limitations and abandoned his work at the Sasseruwa Buddha statue instantly. So this is the reason why it is left uncompleted. Another story does not coincide with this popular legend. Many people believe that the Sasseruwa Buddha was a kind of prototype for the more elegant and accomplished Aukana statue. So thie would mean, that the Sasseruwa Buddha is the older one. This second version explains the unfinalized state of the Sasseruwa statue in a different way. When it was carved from the rock, some cracks appeared in the torso. Due to this mistake the work was abandoned, a second attempt of constructing a statue of such an enormous size was more successfull in Aukana. The modern name "Buduruwagala" means simply "Buddha-image-rock". Buduruwagala is one of the magic places of Sri Lanka. The group of seven rock-cut relief sculptures is situated in a patch of unspoilt dry-zone forest with an abundance of butterflies. It's also a perfect location for birdwatching due to the nearby tank. The seven scultures are carves out from a single rock, in low relief. 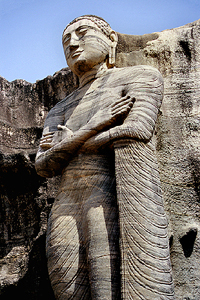 The central figure, which still bears traces of stucco, is the tallest ancient Buddhist sculpture of Sri Lanka, measuring 16 metres in height. The sculptures are dated to the 10th century for stylistic reasons, there are hardly any ancient sources referring to these impressive works of religious art. The Buduruwagala rock statues are undoubtedly influenced by the Mahayana form of Buddhism, which enjoyed a vogue in the island during the late Anuradhapura period, particularly in the south and east of the island. The central statue is flanked by 2 groups of 3 statues each. Both groups depict typical Mahayanist figures. The central of the three figures to the Buddha's right is a white painted sculpture probably depicting Bodhisattva Avalokitesvara, the most venerated saviour in Mahayanism. To the left of this beautiful image in the thrice-bent posture is the only female sculpture known from ancient Sri Lanka, possibly his consort-Tara. Another unique feature can be seen in the other triple grouß, viz the diamond scepter Vajra, a typical symbol in Tantric schools of Mahayana Buddhism. 40 km north of the 7 Buduruwagala sculptures is another rock-cut sculpture belonging to the southern half of the island, which seems to have been dominated by Mahayana Buddhism in sculptural art in the late first millennium C.E. 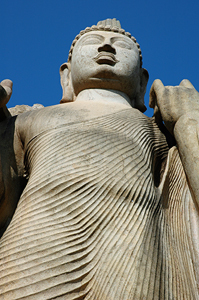 The standing statue of Dova is the only ancient rock-cut Buddha of colossal dimensions that can be found in Sri Lanka's hillcountry. This uncompleted relief of a standing Buddha, similar to he central statue at Buduruwagala, is the highlight of the charming Dowa Temple, 6km east of Banadarawela, just at the main road to Ella, which is used by many travellers during their round tours. Some of the walls of the cave shrine, covered with typical murals, are carved from solid rock, too. The Dova temple is attributed hat King Valagamba, known as Vattagamini Abhaya from the chronicles written in Pali language. Local legend has it, that this famous king took refuge in the Dova caves in the 1st century BC during his 14-year exile from Anuradhapura. Legend also has it that there is a secret underground tunnel stretching from this temple all the way to Kandy or to the Ravana Ella cave, connecting this site with the captivity of Sita, as told in the famous Indian Ramayana epic. ​The excavation area of an extensive monastic complex near the remote village of Maligawila is home to two outstanding Buddhist sculptures, they are called Maligawila and Dambegoda statue respectively. Both statues are originally monolithic, fashioned out of crytalline limestone, but placed far away from the quarry where they had been cut. Ancient monolithic statues of such an enourmous size are found nowhere else in Sri Lanka separated from the original rock, other Buddhist statues of this size are still part of that rock from which they were cut or in which they were carved. Though comparable in this respect, the two statues are completely different in style, the Maligawila statue is a typical image of a Buddha, whereas the Dambegoda statue shows all features of a Bodhisattva, viz royal ornate and hair crown. Presumably, it depicts typical Mahayanist Bodhisattva, Avalokitshvara, but often it is identified as Metteya (Maitreya), or the deity Natha, a local god of Sri Lanka's hillcountry. Just left of the stairway to this statue stands a pillar with an inscription of King Mahinda IV (956-972 AD). It records the work was done to uplift Buddhism and also to lay down adminitrative rules. Both statues had collapsed and fallen to bits. They were restored and reerected in 1991. The Maligawila statue now can be seen in its full glory again, the Dambegoda statue looks slightly more patched up. Parts of some fingers are missing completely. 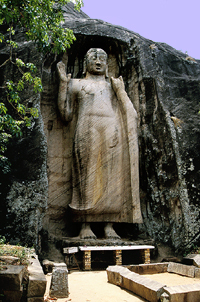 The Southern Province's only larger than life-sized Buddha statue which is carved into a surrounding rock can be found in the outskirts of the well-known beach holiday resort Weligama. The statue is called Kushtaraja. Measuring 3 metres in height, it is much smaller than all other Buddhist rock statues mentioned on this page. However, the adornment of the garment and crown is excellently elaborated and well preserved. Stylistically, the Kushtaraja statue resembles Mahayanist sculptures of Buduruwagala and Dambegoda. The Kushtaraja sculpture, dated to the 6th-9th century C.E., most probably depicts Avalokiteshvara, though the hair crown bears Buddhas en minature, in Buddhist iconography, Avalokiteshwara usually shows only one such "Buddha in the crown". But the iconography was canonized later and Sri Lanka was only in the peripheri of Mahayana Buddhist art. The name Kustaraja, also spelt Kusta Raja, literally means "Leper King". The name refers to the local belief, that the statue represents a king smitten with a skin disease. When he fulfilled, what was prompted in a vision to him, to take coconut pulp and water for three months as a cure, he recovered completely. Out of gratitude, the king then commissioned this sculpture to be carved on the rock in order to commemorate his miraculous cure. 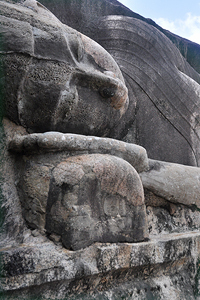 Doubtlessly, the most beautiful rock-cut Buddha statues in Sri Lanka are those of the Gal Vihara in Polonnaruwa. This world-famous group a four images of different types and different sizes is carved out of a granite slope of more than 50 metres length. "Gal Vihara", also spelt "Gal Viharaya", simply means “rock monastery”. The name mentioned in the chronicles is “Uttararama”, meaning “Northern temple”, as it located north of the main monastery, tooth temple and royal palace of Polonnaruwa. The landmark scuplture of the Gal Vihara and of Polonnaruwa and of the entire island nation is the reclining Buddha, arguably the best example of its kind all over Asia. Close to the head of this wonderful recling Buddha is the equally elegant standing statue of the Gal Vihara. Its most striking and most discussed feature ist the very uncommon gesture, with arms crossed in front of the breast. In Hindu art, this the Svastika Mudra of veneration. Usually a Buddha is venerated by other human and devin beings, but not depicted venerating other. This is a reason for the common belief, that Sri Lanka's most elegant standing rock statue is nit depicting the Buddha but his disciple Ananda, in grieve because his master, depicted by the neighbouring reclining statue, is passing away. Against this interpretation, the rock statue is standing on a lotos pedestal, which iconographically indicates a Buddha and not someone inferior. Thanthirimale, is a delightful ancient site. There is much more to see than the reclining Buddha carved from the northern slope of a granite rock, though this rock Buddha alone would be worth visiting, The sculpture is heading east and facing north, the latter being the direction of death, as this direction is avoided by the sun, at least on the northern hemisphere of our planet. 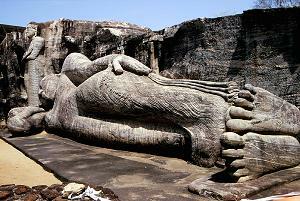 The large Thanthirimale rock statue is 14 metres long, the solid granite is removed 2 metres deep. A drip ledge is cut into the stone to drain water without harming the building that covered the Buddha statue. Like all other sculptures mentioned on this page, the reclining Buddha of Thanthirimale was once a part of a shine room, though it appears to be an open-air work of art. Originally, it was not. Brick works and also some holes in the rock surface indicate, that this recumbant Buddha was once sheltered under a roof. The reclining Buddha statue of Thanthirimale ist of almost of the same dimensions as its famous counterpart in Polonnaruwa. Though the Gal Vihara Buddha is much more elaborate, there are also some similarities in style, for example the robe is carved slenderly, revealing the shape of the body, the belt of the robe being easily recognizable and the inner robe reaching the ankle, surpassing the outer robe.. One of British Ceylon’s colonial commissioners of archaeology, H. C. P. Bell, presumed that both colossal reclining Buddhas are works of the Polonnaruwa period. Though not far from Dambulla, Bakamuna remains to be a rarely visited site. Situated 2 km outside Bakamuna, the Buduruwayaya temple has one of the three large rock-cut reclining Buddhas from Sri Lanka's Polonnaruwa period. This recumbant figure called Attaragollewa Buddha. Parakramabahu I is credited with the innovation of the Buddha’s Parinibbana in Sri Lanka's most ambitious larger-than-life works of sculptural art. Several such reclining images from his own reign and the following periods are found dispersed in many ancient sites in Sri Lanka. But, as mentioned, only three of them are rock-cut giant Buddhas. Of these, the Attaragollava Buddha of Bakamuna is the smallest one, 12 metres long, and the most weathered and demaged examples, too. As mentioned in the introductory paragraphs, the reclining Buddha is more suitable symbol for the Theravada school of Buddhism, which became the island’s sole religion due to King Parakramabahu's monastic reforms.